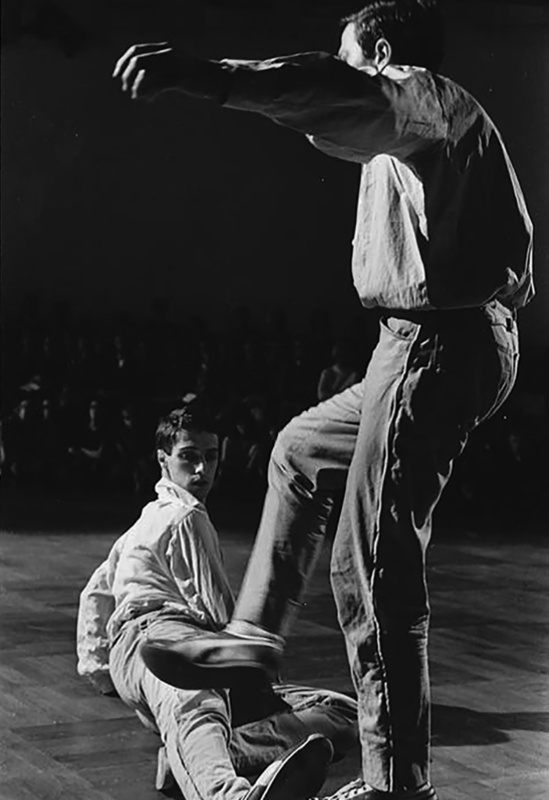 In 1964, the Steve Paxton and Robert Rauschenberg performed Jag Vill Gärna Telefonera (I Would Like to Make a Phone Call), in which they interpreted a collage of mostly sports photographs by mimicking each pose while freely linking the images through their physical movement and contact. In 1982, Paxton gave the score to his student, Stephen Petronio, who performed the work with Randy Warshaw for a program of Judson-era reconstructions co-sponsored by the Bennington College Judson Project and Danspace Project at St. Mark’s Church. For The Museum of Modern Art’s exhibition, Judson Dance Theater: The Work Is Never Done, Stephen Petronio Company will reconstruct the 1982 version and create new interpretations of Paxton’s score. This program also includes Stephen Petronio Company’s Excerpt from Goldberg Variations (2017), based on The Goldberg Variations by J.S. Bach Played by Glenn Gould Improvised by Steve Paxton(1986–92), and will be performed by Nicholas Sciscione and Megan Wright an ethereal solo that Paxton performed in empty dance halls and in the woods, among other unorthodox locations. Performances are included in museum admission.